Falconry, training raptors to hunt for game, is particularly suited to vast grasslands especially in combination with horses and dogs. The earliest images of falconry appear in Assyrian and Hittite reliefs of the 9th and 8th centuries BC. Classical Greek and Roman authors Ctesias, Aristotle, Pliny, and Aelian described falconry, and in about AD 1270 Marco Polo detailed how the nomads of Central Asia hunted on horseback with small falcons, hawks, and eagles. For thousands of years, golden eagles have been the favorite raptor to train as a hunting companion across the northern steppes from the Caucasus to China. Eagles are strong predators especially adapted to winter hunting for hare, marmot, deer, fox, and even lynx and wolf, in snow-covered grasslands and mountain crags. Female eagles, larger, fiercer, and more powerful than males, are preferred. Fledglings or sub-adult eagles are captured and trained to hunt. After about 10 years they are released to the wild to mate and raise young. Evidence pointing to eagle hunting's antiquity comes from Scythian and other burial mounds of nomads who roamed the steppes 3,000 years ago and whose artifacts abound in eagle imagery. An ancient Scythian nomad skeleton buried with an eagle was reportedly excavated near Aktobe Gorge, Kazakhstan. Ancient petroglyphs in the Altai region depict eagle hunters and inscribed Chinese stone reliefs show eagles perched on the arms of hunters in tunics, trousers, and boots, identified as northern nomads (1st to 2nd century AD). A Song Dynasty (AD 960) painting shows Khitan nomads of Manchuria practicing their ancient eagle hunting arts. Other eagle-hunting groups in the past included Jurchen, Oirat, Torghut, Kyrgyz, Kalmyk, Kirei, Altaian, Siberian, and Caucasus nomads. Eagle hunting lore is preserved in ancient poems of Central Asia, such as the Kyrgyz Manas epic, in which the hero's death is mourned by his horse, dog, and eagle. In ancient Caucasus legends about great heroes and heroines ( Nart Sagas ), hunters set forth on fine steeds, hounds trotting along and golden eagles on their arms: “Your horse is ready, your weapons and armor, your hounds and your eagle too.” In eagle hunting, dogs serve as beaters for the eagles. “Our ancestors had three comrades,” goes the old Kazakh saying, “ swift-foot, tazy , and bürkit” (fine horse, Taigan sighthound, and golden eagle). By training these three animals—horse, dog, and eagle—to be companions, the early nomads made the harsh, unforgiving steppes into a land rich with accessible game for furs and food. Today, the ancient arts of bürkitshi ( berkutchi, eagle hunters) are carried on by Kazakh nomads dispersed in Mongolia, Kyrgyzstan, Kazakhstan, and Xianjiang (northwest China). The tradition is handed down from generation to generation. One must be tough and patient to learn to hunt with such a formidable bird of prey as the golden eagle. There are nuanced, complex distinctions among capturing, domesticating, training, competing, and actually hunting with eagles. Male bürkitshi are more common than females today, although eagle hunting has always been open to interested girls. Archaeology suggests that eagle huntresses were probably more common in ancient times. Spectacular archaeological discoveries of graves (ca 700 BC to AD 300) across ancient Scythia, from Ukraine to China, reveals that steppe nomad females engaged in riding and hunting activities and about one third of the women were active warriors in battle. Unlike settled, patriarchal societies like classical Greece, where women stayed home to weave and mind children, the lives of nomadic steppe tribes centered on horses and archery. Men and women shared the vigorous outdoor life and everyone rode fast horses, shot arrows with deadly accuracy, hunted game, and defended the tribe. The combination of horse riding and archery was the equalizer: a woman on horseback is as fast and agile as a man. This ancient way of life—embracing gender equality—was essential for tribes migrating across oceans of grass, and egalitarian traditions persist in their descendants today. Remarkable archaeological evidence of a female bürkitshi in antiquity emerged among the famous Urumqi mummies preserved for more than two millennia in the extremely dry Tarim Basin (Xinjiang). The tall, lavishly dressed bodies of men, women, and children were naturally mummified in the arrid desert sand, buried with horse gear, clothing, weapons, and other possessions. One woman wears a sheepskin coat over a colorful woolen skirt; on her left hand and forearm is a heavy leather falconry mitten. The exceptional size and thickness matches the distinctive bialeye, protective mitt, worn by eagle hunters in the same region today. Eagles weigh up to 12 pounds and have a very strong grip. To support the eagle on the rider's arm, a baldak, a Y-shaped wooden rest, is attached to the saddle. Another piece of archaeological evidence for eagle hunting by women in antiquity came to light only recently, on an ancient golden ring (Greek, 425 BC) in Boston's Museum of Fine Arts. The full significance of the scene eluded understanding until now. The ring shows a nomad horsewoman, her hair and cloak blowing back to indicate the speed of her galloping horse. She has the reins choked up tight, with a spear in her left hand. The deer is so finely detailed that we can tell the species--a Eurasian spotted fallow buck with broad palmate antlers. Her dog is a Taigan sighthound like those used today by Kazakh eagle hunters. Art historians had assumed the large bird was a random decoration. But in 2014, in The Amazons: Lives and Legends of Warrior Women across the Ancient World, I identified this naturalistic scene as the earliest known image of a female eagle hunter. The bird hovering above the deer’s head is an eagle with hooked beak and spread wings and tail, about to attack the deer. The ring is compelling evidence that ancient Greek travelers, who first encountered steppe tribes in about 700 BC, had heard about or even observed nomadic horsewomen of eastern lands hunting with trained eagles and sighthounds. In addition to artistic and archaeological evidence, an intriguing hint that women might have been more involved in eagle hunting in the past is embedded in a persistent folk belief. Kazakhs traditionally associate bürkitshi with fertility and childbirth. Today about 250 eagle hunters and a handful of young eagle huntresses are keeping the ancient tradition alive. Barber, Elizabeth. 1999. The Mummies of Urumchi. London, pp. 98 and 198, Fig. 10.3. Colarusso, John. 2016. Nart Sagas: Ancient Myths and Legends of the Circassians and Abkhazians. Princeton University Press. MacWilliam, Ian. 2004. "Kazakhstan's Eagle Hunters." BBC News, Dec. 16. Mayor, Adrienne. 2014. The Amazons: Lives and Legends of Warrior Women across the Ancient World. Princeton University Press. The calm resolute and gracefull beauty of people from the ancient steps, far and away belittles modern western society! Strength of family bonds, and desire to thrive in nomadic wilderness is taught to children, strength of the woman as well as the man, and the woman and man honor each other and care for children in deep ways that no other culture -(except first Nations Americans, who are reletives of Kazakhs and Mongolians) can appreciate! All the modern westerner snowflakes, as well as evil backward people in the world take note! The future belongs to these brave traditional people from the open grasses and broad mountains of Asia! The more I argue with you, I will not! I live here in Kazakhstan, I am a nomad, and I falconer. Excavations of Scythian burial mounds are located 10 km. from my house. If you want to become familiar with the material that come to me for a month and tarry life of nomads, then we will continue the conversation. First, my research on the history of eagle falconry is not from the Internet but based on the work of historians of falconry and steppe nomads and the archaeologists of the Tarim Basin mummies. Please see the reference list for Parts 1 and 2 of this article, esp. Central Asian Falconry, the works of T. Soma, and for the archaeology of Tarim mummies, see Elizabeth Barber and Victor Mair. Second, the Tarim Basin archaeologists Mair and Barber provided the photo and drawing of the female mummy with falconry mitt now in the Urumqi museum. The female mummy eagle hunter is not "the Altai mummy queen" as Qazak says (and she was not Kazakh, but probably Tocharian). Many photos of this female Tarim Basin mummy on the Internet show a reversed image with the mitt on the right hand. In fact, it is on her left hand. 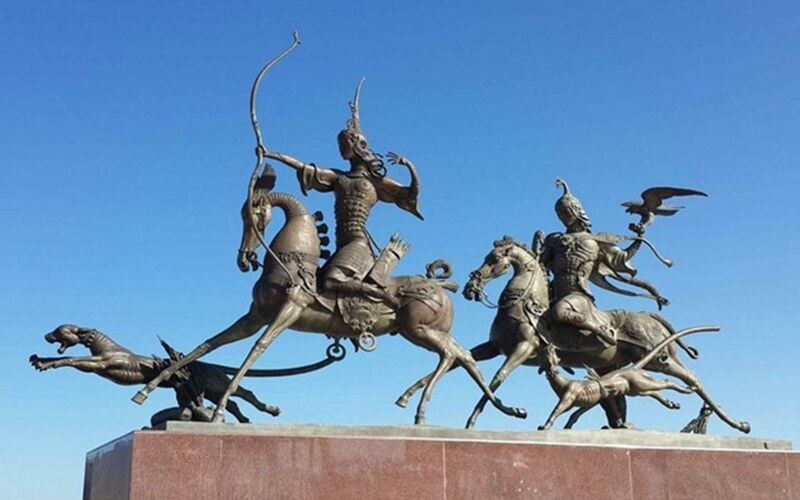 Qazak is correct that todays' Kazakh and Kyrgyz eagle hunters wear the gauntlet on the right hand, leaving the left arm free to control the horse. But this style is relatively recent. The handedness practice has evolved since antiquity, as reported by many falconry historians. In ancient times the mitt was usually worn on the left arm, leaving the dominant right arm free for weapons--from the days when steppe nomads were active warriors using swords. For example, Mongols carried the eagle on the left arm. Eagles were also perched on the left arm in antiquity when the hunter was on foot, again leaving the right arm for weapons. Ancient images show both right and left handed perches. Third, your claims about nomad women's roles in antiquity are based on modern assumptions and do not apply to antiquity, as demonstrated by archaeological and historical evidence. Kurgan graves across ancient Scythia from the Black Sea to the Altai show that nomadic men and women participated in the same physical activities of riding and hunting. The only "herds" in antiquity on the steppes were horses (other herd animlas came later). Archaeological discoveries of the ancient graves of more than 300 women shows that they were buried with the same weapons, armor, and horses as the men (and men were buried with jewelry, needles, mirrors, like the women). For these facts see chapter 4 of "The Amazons: Lives and Legends of Warrior Women across the Ancient World" (Princeton University Press, 2014). Article largely resembles delirium. The author is not well studied topic, and gathered all the facts on the Internet. One of the facts about the gauntlet from the Altai mummy queen. Glove mummy on the left hand, although the hunters and horsemen in Asia were birds on his right hand. Women nomads mainly sat in the house and could not go hunting or war. While the man was hunting or fighting, the woman had to look after the children and the cattle, collect firewood, to cook, to sew clothes, dress skins. In women, the nomads were not physically possible to do other things. Learn the history and communicate with these nomads, and then you will understand the mentality and history of the nomadic people.